Monitoring is undertaken by WMC, a specialist company contracted by O2 to monitor the Payforit service. They carry out their work on a daily basis. When a violation is identified, it is classified as a red or yellow card offence details are applied and sent to Mike Round (Head of Interactive Messaging Products) weekly. On receipt of the summary from WMC, Telefonica O2 sends a yellow or red card (as appropriate) to the relevant Level 1/Level 2 provider, who is then requested to make the necessary changes, so as to be in line with Telefonica’s audit standards and the PhonepayPlus Code of Practice. O2 Prepay or contract customer contacts the relevant care agent. Care agent undertakes security check on Prepay confirms data for Postpay and then looks up via Your Companion (online tool) to identify the shortcode and the services using that shortcode and the Level1/Level2 contact details. On discussion with the consumer if they wish to call the Level1/Level 2 themselves the appropriate telephone number is given as displayed on the care form so that the consumer can call direct to query the charges. If the consumer does not wish to call separately then the care agent would complete the relevant online form on behalf of the customer which is then automatically sent to the Telefonica O2 offshore team that deals with escalations. The consumer is kept up to date via SMS messages. If the consumer does not get any satisfaction from calling the Level1/Level2 and calls back to us to resolve the issue we would then complete the online form and the details would be sent automatically to our offshore team to deal with. The offshore team would then contact the appropriate Level 1 provider and request the call logs to confirm what issues the consumer has raised. The offshore team then return these findings to the relevant care agent who initially dealt with the consumer query and they then contact the consumer to confirm the findings and apply credits if appropriate. Submission to OfCom on the subject of the Management and Operation of the Payforit Scheme rules. In July 2011 OfCom issued a “Review of Premium Rate Services- An application of the analytical framework” and the Mobile Broadband Group led by Hamish MacLeod facilitated the MCP response to the review. 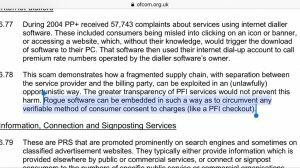 Following a meeting at OfCom offices on the 2nd November 2011 it was agreed by the MCP attendees to supply OfCom with a document outlining the current management and operation of the Payforit Scheme rules particular to each MCP. This document is submitted by Vodafone UK to OfCom and should be viewed in conjunction with submissions from the other UK MCPs in support of the principal that the UK MCPs continue to self-regulate the Trusted Mobile Payment Framework and associated Scheme Rules known as ‘Payforit’. It is important that key elements of the context in which Payforit sits within Vodafone UK is outlined before detailing specific initiatives relating to its management. 1. Customer Focus: Vodafone UK holds to business principles that includes a requirement for each and every employee to place Vodafone UK’s customers’ satisfaction central to each proposition delivered and in support of this and requires aggregator partners to sign contracts that look to protect Vodafone UK’s customers’ best interests in terms of clear and fair pricing and simple methods of redress should the situation arise. 2. Partner Rationalisation: To ensure Vodafone UK only works with trustworthy partners, over the last two years it has been reducing the number of aggregator partners who are allowed to directly connect to the Vodafone UK network to provide content using MPay (Payforit), SMS,MMS or Voice/video services to Vodafone UK’s end customers. 3. Proactive Partner Management: In September 2011 Vodafone UK launched an aggregator partner program. This looks to refine this attitude still further, a number of categories were defined and these are broadly based on products that they have with Vodafone UK, the volume of business transacted and Vodafone UK’s view of the way aggregator partners do business with it. It is fully Vodafone UK’s intention to have Aggregator Partners categorised based on performance which will act as an incentive for aggregator partners to behave in a trustworthy and customer centric way. Management and Operation of the Payforit Scheme rules within Vodafone UK. • The Payforit Scheme Rules are designed to protect the Consumer and ensure the Merchants and their Payment Intermediaries deliver a great user experience to ensure satisfied customers return to the service. • The Scheme Rules exist in parallel and are distinct from the other PRS services regulated by the PhonePay Plus 12th Code of Practice (CoP). • In fast paced environment in which the aggregators and MCPs function, Payforit has adapted and will continue to adapt at a speed unlikely to be achieved by any formal regulation. Each Aggregator Partner has signed contracts that stipulate compliance with English Law, Payforit Scheme rules, Vodafone PRS CoP, Vodafone 3rd Party Content Standards and other relevant Advertising CoP and PRS CoP. • Vodafone UK’s Fraud, Risk & Security (FRS) teams actively monitor data/voice traffic to identify fraudulent patterns of activity. Product Managers (PM) are required to escalate, block traffic and/or withhold revenues to aggregator partners when requested. • Vodafone UK conducts independent security access audits to ensure secure protocols are used by aggregator partners to access its Age Verification (AV) systems. AV is based on a contractual undertaking between Vodafone UK and the end customer. Customer Services log complaints and approach product managers to resolve issues as required. • Product Managers conduct audits of aggregator partners and their adherence to Payforit Scheme Rules. Each aggregator partner is subject to spot audits and requests for information to support any investigation. 3. Vodafone UK enforcement process. • Financial claw-backs. A system of claw-backs exists whereby credits, disputed revenues and costs incurred to Vodafone UK are removed from Out Payments in line with contractual terms. i. Issues that are common to all MCPs tend to be reported quickly via the automated system that O2 has installed. ii. As the number of Aggregator Partners has been drastically reduced and the BDM management ensures the dialogue between Vodafone UK and its Aggregator Partners manages conflict effectively. 3. Using their training and a support script the agent identifies the shortcode and provides the merchant’s name and contact number and advises the customer in the first instance to approach the merchant for an explanation and/or refund. 4. If the customer returns to Vodafone UK dissatisfied with the outcome then the Vodafone customer services agent will take responsibility for remedying the situation and crediting the customer directly. 5. The customer care team keep a central log of complaints and issues to help resolve customer experience. If a merchant is flagged as a recurring problem then the product manager is informed and asked to investigate the cause of the customer dissatisfaction. 6. Credit is moved to the Out Payments team who clawback the credits and costs pertaining to the customer. The customer was directly credited £210 by Vodafone UK on the 31.10.11 when the ‘due process’ had been followed to determine the validity of the claim. The customer logs show that she signed up online for a service on 31/03/11 and has had regular charges of £18 a month £4.50×4. This case was resolved in a single day by the Vodafone UK Customer Care team in the normal process (with no prompting from external parties) and the customer was satisfied with the prompt resolution that Vodafone UK delivered for her. This case was not escalated to the product manager as the issue was not deemed to contain fraud and would have been included in the weekly credit report. These report appeared during the period 16th-31st October 2017 on the GiffGaff forum. There were numerous similar reports in other forums and social media..
Phone-paid Services Agency say that there is not sufficient evidence ‘on the balance of probabilities’ that there was anything wrong! Just how much evidence would they need before it became obvious that the sign-up process for this ‘service’ was not compliant with the regulator’s Code of Practice. Are PSA saying that all these consumers were lying, and knowingly signed up to this? This has totally destroyed any confidence I had in PSA as a regulator.